On July 27th, The Nib posted a comic by Ward Sutton exploring reactions to the #MeToo movement. The comic was... not delicate. The WWAC team weighs in. The #MeToo movement has forced many people—from the men accused to casual consumers—to come to terms with the realities and consequences of the unwise, malicious, or dehumanizing behavior present in pretty much every industry. On July 27th, The Nib posted a commentary on some of the conversations that have ensued, a four panel comic by Ward Sutton. The comic is entitled “The Lives Ruined Because of the #MeToo Movement,” and after doing a strong double-take at the title and logline (“The real victims speak out on Charlie Rose, Mario Batali, and Juno Díaz”), we sat down to try to work through our feelings about the strip. When you read this strip, what’s the message you get out of it? Is it what you expected it to be based simply on the title and logline? Heather Wells: At first glance, I wasn’t even going to read the comic. That title and logline do not read as sarcasm or humor or whatever he’s going for, so the comic definitely wasn’t what I expected. Even after reading it, I’m not sure I get the point. It’s parody, I think, mocking people who feel they can’t like something any more, but is that really a contribution to the conversation that anyone wanted? I don’t think it is. Zora Gilbert: I think the message, buried under a layer of irony and behind a misleading headline, is that we shouldn’t spend time clogging the conversation with superficial complaints. I can get behind that—I’ve told friends off for doing it at inappropriate times!—but it’s not what I thought was going to be behind that title, and I sure didn’t need to dig for it the way The Nib seemed to want to make me. Laura Stump: When I started reading, I thought it might be riffing off the people who have been complaining how they can’t even talk to the women they work with for fear of being accused of sexual harassment. Because those folks are acting as though they’re being completely victimized by the current situation, and it’s ridiculous. Then I realized, no, we’ve gone for the folks who have come up against the realization men they respected have turned out to be pretty lousy human beings, leaving the legacy bits of themselves these folks have accumulated and possibly cherished tarnished. It was not the twist I was anticipating. Kat Overland: Like, I “get” it after reading it, but I think it’s pretty crass and not particularly thoughtful. Yeah, the first panel guy feels real enough, but the rest aren’t goofy enough to live up to the satire he’s aiming for. They’re just straw women of color. Corissa Haury: I was taken aback at first at the idea that a title of a cartoon and the theme would seem to trivialize the situation. On top of that, I’m baffled as to what the actual title of the comic strip itself might be. 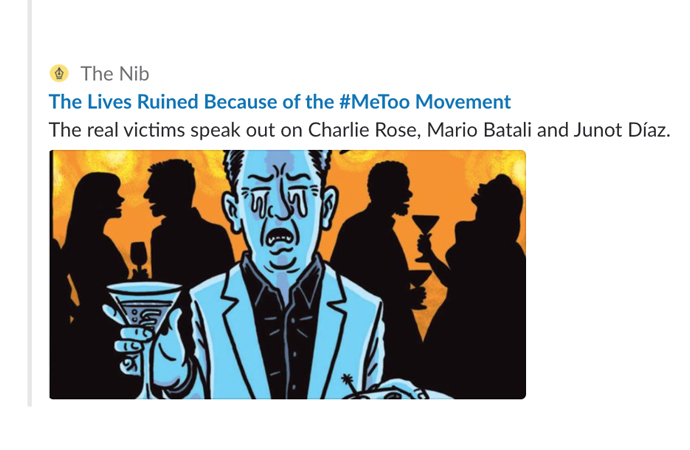 The Nib has titled it “The Lives Ruined Because of the #MeToo Movement,” but the artist seems to have titled it “#MeToo Collateral Damage.” Which is it? And how is this a time to “joke” about an important movement that means so much to so many people? Who do you think is the target of the joke, on first read? How did you feel when you read the comic? When you saw the headline, the logline, and then read through the comic itself? Zora: I read it as mocking the folks who, as spectators, bemoan the ways that #MeToo has (fairly trivially) impacted them—those who complain loudly because they can’t watch Firefly anymore because of the allegations against Joss Whedon, or because they really liked Chris Hardwick and now they just can’t have heroes. While I don’t love this representation of the message, the comic itself isn’t nearly as bad as I thought it was going to be. I had braced myself for an extended Nib roundup giving a platform to folks who had been accused of sexual misconduct. I almost didn’t open the link! Heather: I had basically the same reaction, Zora! Even after reading past that terrible title, I’m conflicted on how I feel about this strip. Yes, he’s making these reactions seem ridiculous, but that’s part of why it bothers me. Even if it wasn’t his intent, painting those responses as ridiculous can be read two different ways: it’s ridiculous they are upset, and it’s ridiculous they’d even do those things (like donate a signed first edition) at all. Laura: I agree. But I was a little more irritated because those are actually pretty normal reactions to have, especially if you’re talking about a piece of culture that had a strong impact on your life. Saying, “I can’t watch Buffy anymore,” isn’t necessarily being shallow about a piece of media; for many people it’s a shorthand way of saying, “This thing that molded a part of my life or deeply impacted me has turned out to be built on lies.” It’s really only worthy of mockery, to me, if the person who’s lost a little something never moves beyond that “woe is me” moment to appreciate how much more the victims lost. Corissa: The first time I read it, I definitely felt like the target was the #MeToo movement in general, that it was causing these shallow situations as a result, however absurd they may be. Then I read it a couple of times again and researched the editorial cartoon work that the artist Ward Sutton does for The Boston Globe and in his own work. He has represented minorities and immigrants, and the absurdity of white privilege. I realized that he’s making fun of people who are taking away from #MeToo, though it did take some reevaluation and research to get there. My initial reaction was definitely shock, like how could someone feel that it’s okay to make this into a comic strip? Do you think this comic was an effective way to convey the message you read in it? Corissa: No, not at all on the initial read. Laura: I think having someone who lost more than just pieces of media or social influence would have resulted in a more well-thought-out comic. People in a lot of demographics other than “white male” have had things upended by the revelations of #MeToo, and I think they would have brought a great deal more nuance to the table in a comic like this. Kat: What pisses me off the most is the Junot Diaz panel, because Diaz targeted Latina—especially Afro-Latina—women, while at the same time was being positioned as some kind of culture hero for Latinxs in the US. Of course, there’s going to be a melancholy, gut-churning response from his fans, especially women of color, who felt seen or represented by what seemed to be a clear eyed examination of toxic machismo in his work. So, to create a black woman avatar being upset for this joke feels gross and also like a severe misunderstanding of what happened. The joke is that she’s ashamed to “show off” her first edition, but it’s not punchy enough to make it clear that she’s upset about losing her book world cred, rather than upset about losing what was an important voice for her life. To have two women of color in the comic contrasted against two dopey white guys is a real miss. Corissa: I think maybe he’s trying to show representation here. But including women and a woman of color in this jab at people who don’t take sexual assault survivors’ stories seriously might be in poor taste. Thought he may not realize it, it comes off as extremely try-hard and offensive to the women who have come forward with their stories of serious assault. I think it’s also weird that he didn’t choose offensive white men like John Lasseter or Harvey Weinstein. As Kat said, it feels as if he is targeting minority populations and not in a good way. I think he really should have stayed away from this topic, or if he was going to do it should have drawn a bunch of whiny privileged American white men, because that is exactly the group of people pretending they’ve been hurt by the truth about their favorite celebrities. Kat: I usually appreciate their topical roundups. Getting several cartoonists to create four panel responses to prompts usually results in diverse takes, as well as gives multiple creators space (and $$$), so I think one problem with this is that it’s on its own with no context from other POVs. Zora: I totally agree! I love the chance to see a bunch of different viewpoints in easily-digestible chunks, but the beauty of the roundups is in their many contributors. A single four panel comic can’t necessarily convey a lot of nuance, but a series of them looking at a topic from different angles certainly can. In this case, though, with only one strip from one cartoonist? It just doesn’t work. Laura: What you both said. These four panels just don’t lend themselves to this topic all in their own. I think there is a lot to explore within the concept of “The Lives Ruined by the #MeToo Movement,” but four panels by a single person isn’t enough to do it justice. Corissa: I do generally enjoy that about The Nib, but in this case I don’t think this did a good job of packing the punch that it could have. I’ve seen some longer pieces out there, and this kind of topic definitely deserves more than four panels, even if you think it’s a timely “joke” topic. The women who have come forward with their #MeToo stories deserve a lot more respect than a four panel cartoon strip written tongue-in-cheek for money. If you’d like to read more about the #MeToo movement, this profile on founder Tarana Burke, this October 2017 summary, and this recent timeline—all written by women—are great places to start.